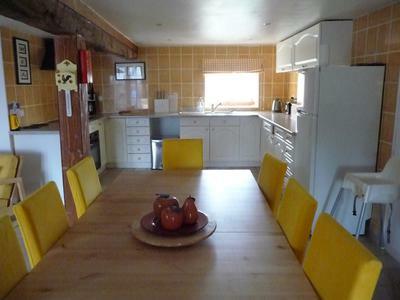 This traditional building is ideal for family couples with young children. It is within easy reach of all major attractions and necessary facilities for an enjoyable "break from it all". We also welcome families living with learning difficulties and reduced mobility and we are happy to consider specific requests. Just ask! The property benefits from its own fenced and fully gated terrace and BBQ area and there is parking off-road for 2 vehicles. •The Kitchen / Dining area with dining table and chairs, oak beams, comfortable settee and armchair, large fully equipped kitchen, windows or doors to both sides of the room giving a superb sunny aspect. •The lounge, which has old oak beams. There are comfortable sofa's, coffee tables, TV with free-view channels and the bookcase and games for those who want them. •Fully tiled shower room containing shower cubicle and wash hand basin, large mirror with lights over, washing machine and ironing board. 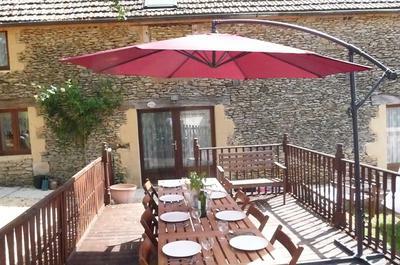 •Leading from one side of the kitchen/diner is a sunny terrace for al fresco dining. From the era of Prehistoric Man through the middle Ages and beyond, the Dordogne and Lot area is a sightseer's paradise - steeped in history. The Dordogne region also formed the historic frontier between France and England during the Hundred Years War and this rich heritage offers a renowned variety of sights for you to discover on your sightseeing break in France. This famous 13th century bastide (fortified) town of Domme was founded on a dauntingly sheer cliff eight centuries ago, high above the Dordogne valley. Classified as "L'un des plus beaux villages de France", Domme offers cafes and restaurants with stunning views over the river. 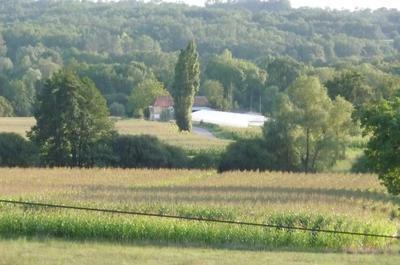 Like Domme, La Roque-Gageac is one of the many villages labeled as "L'un des Plus Beaux Villages de France" in the area. Situated on the banks of the river, the ochre-coloured houses are built directly into the face of the huge cliff that overhangs La Roque-Gageac. When sightseeing in La Roque-Gageac, you can take a ride on a Gabare, the traditional flat-bottomed boats of the Dordogne that used to trade goods up and down the river. Les Eyzies, the prehistorical centre of France, is situated below limestone cliffs where our direct ancestors used to roam 40,000 years ago. The Vézère Valley in particular houses some 250 UNESCO sites including caves and rock paintings, making it the undisputed 'Prehistoric Capital of the World'. Le Bugue - tuesday market, village of Bournat (craftsmen, animals, funfair), Aquarium, Proumeyssac underground crystal vault. Les Eyzies - prehistory centre of Europe, grottos, shelters, caves-paintings, museums, Roc St Christophe, Cap Blanc and other prehistoric sites. Monpazier - beautiful bastide, perfect rectangular townplan, galleries. The Perigord is renowned for its Confit de canard (duck), its world-famous foie gras, truffles, goat's cheese and walnuts served in salads or in the delicious Gâteau aux Noix. Local red wines from Cahors and Bergerac, and the famous white Monbazillac are bound to find their way onto your table. 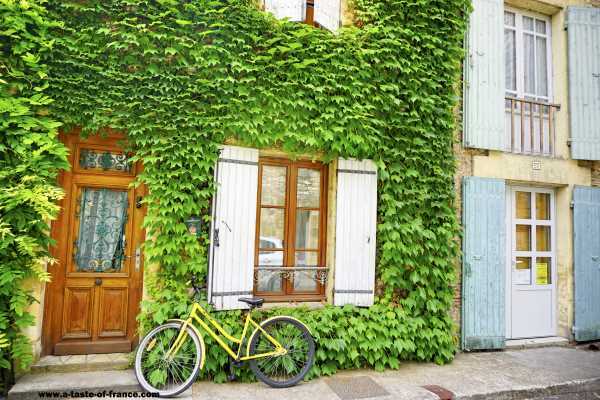 From Haute-Cuisine and Michelin Star restaurants to simple and delicious Auberges serving local produce and specialties, the Dordogne / Lot region offers an unforgettable culinary experience. - Cinema - Music Festivals - Adventure Playgrounds - Ancient Cave Paintings. All these activities are a short drive away. 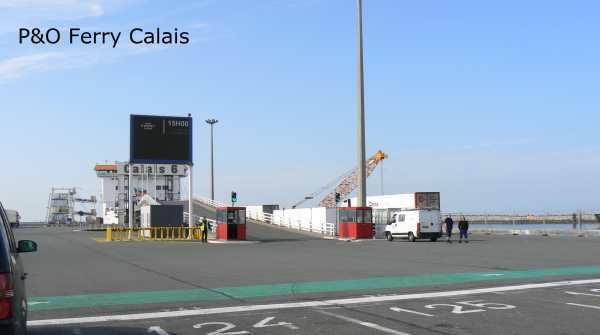 Easily reached by the A20 motorway La Plaine Fajoles is 786kms (8 hours) from Calais and 640 kms (7 hours) from St Malo. You may wish to try P&O Ferries, Sea France or DFDS Seaways for Ferry Times and Rates. The Paris-Brive direct service takes just under 4 hours and we are 35 minutes from Brive. Alternatively, you can take the Paris-Toulouse service which stops in Souillac, 15 minutes drive from our location. You may wish to try the Eurotunnel & TGV Rail websites for travel Times and Rates. Detailed directions will be supplied by email on confirmation of booking. From the moment we walked in we regretted having only managed to get the accommodation for four days and wished we had been there for our full two weeks in France. Everything had been thought of with well equipped and beautifully presented accommodation (lovingly restored by the family). On day one, having driven for nearly eight hours we were greeted by Megan who immediately made us feel at home. Table laid and the meal she had prepared ready to heat up while we unpacked - the food was just delicious and well worth the money. We would highly recommend anyone staying at Nicotiana to definitely pre-order this. The area was beautiful and our three teenage children spent two days swimming, sunbathing and canoeing at the Dordogne River in St Julien. We also spent some time at the Lake (complete with sandy 'beach', fishing and pedalos) in La Mouline, Grolejac and ate at the La Table du Maris Restaurant - recommended by Megan and well worth the visit. 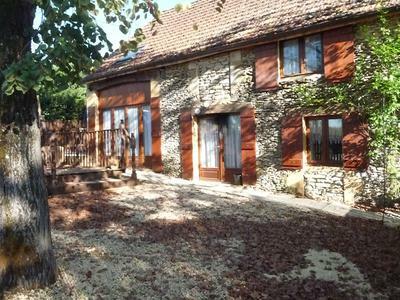 This is such excellent accommodation with lovely hosts ... and the only reservation we have in recommending it is that it will affect its availability for us on our next visit to France! !